Beats X Alternative – All the features, 1/3 of the Price. I dont know why it gets me going, maybe its because I hate seeing my friends pay 4x the cost for something when there is a comparable, if not better, alternative for them. The latest one to get under my skin has been the over the top number of advertisements I’ve seen for Beats X, the Beats by Dre wireless bluetooth earbuds. Now there are hundreds of reviews about Beats by Dre and most of the reputable ones tell you they are decent headphones that a bass heavy and always overpriced. You’re paying $50 for headphones with a $250 image tax for those who want the logo on their ears (or around their neck in most cases). The Beats X just came out and while I admittedly know nothing about them, their advertisements instantly reminded me of another pair of headphones that I do know a lot about. I didn’t need to but I went to check the price of Beats X and of course they are $150, which is cheap by Beats standards but ridiculous if you know anything about audio quality. Speaking of audio quality, I’m not an audiophile by any means. I’m just a dude who likes clean, good sounding headphones that are affordable. 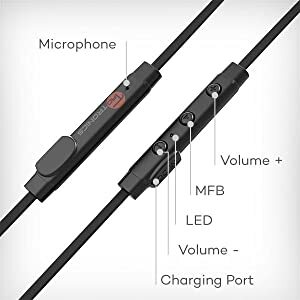 I’ve purchased all kinds and use different ones depending on the scenario but the ones I use most are the ones you should buy instead of the Beats X, the TaoTronics Bluetooth Headphones, Wireless 4.1 Magnetic Earbuds Stereo Earphones, Secure Fit for Sports with Built-in Mic [Upgraded Version]. Now you dont have to take it from me, there are over 6400 reviews for these on amazon with 83% either 4 or 5 star. That’s enough social proof for me but even if you’re skeptical b/c everyone is faking Amazon reviews these days, the TaoTronics are in the clear from ReviewMeta. Everything the Beats X is advertising, the TaoTronics headphones have except maybe the quick charging but I’ve never needed that feature. I use the TaoTronics every morning for my brisk morning walks with the dogs and my workouts and a wide range of audio. Podcasts, Music, conference calls, all sound great on these $37 headphones and while Beats X is advertising 8 hours battery life, i’ve gone weeks without charging the TaoTronics. They sound great, they stay secure in my ears, the battery lasts a long time, mic and controls and the fancy magnetic back that Beats X thinks is so innovative. For those of you that might be skeptical about a brand that you’ve never heard of, TaoTronics has a lot of products on Amazon and almost all of them are highly rated. You can see their full range of products here. Anyway, if you’re looking for an alternative to the Beats X or just looking for a solid pair of bluetooth earbuds, check these out. You will not be disappointed. At 4am Wed night/morning Leigh Ellen and I started our journey to Asia which will be our second trip to the continent this year (China in Jan). In typical Evan fashion I put this together in a very random fashion. Two of our good friends moved to Singapore and we think it is important to visit in the first year as it is a time when you start to miss home a bit. And if you are traveling to the other side of the world you might as well take some extra time to make it worth while. This trip we are going to Japan, Cambodia, Singapore Bali, Vietnam, and Hong Kong. We might have over extended ourselves with too many stops but we’ll make the best of it. So anyway we headed out at 4am and caught a short flight to Toronto and that’s where things got interesting. Our itinerary perplexed pretty much every Air Canada employee who saw it because we were going RDU to Toronto to Calgary to Tokyo when most people go direct to Tokyo from Toronto. We get into Toronto and stroll to our gate to find out our gate got switched and we had to walk clear to the other side of the airport. No sweat, our flight got delayed 30 min so we had plenty of time. After getting there we were called to the counter which is usually a bad sign and when the lady started off with “well we have a 2pm flight to Tokyo” I assumed the worst. Then she asked if we wanted to be moved to the direct flight 4 hours from now and offered us meal vouchers and an exit row seat. The flight was supposed to land 20 min after our original itinerary so with a direct flight, meal and an exit row we didn’t hesitate to make the switch. Another lady showed us and escorted us to customer service to get our “meal voucher and compensation.” LE and I both looked at one another and smiled at the little victory. Little did we know Air Canada gave us $400 as “compensation” which was nearly the cost of 1 of our tickets. Double win! We ate a surprisingly good Canadian cheeseburger, drink and waited for our flight. Little did we know that we got switched to the direct flight that was also a brand new Boeing 777 with all the bells and whistles. Triple Win! The in-seat entertainment and exit row legroom made the 10 hour flight extremely painless. A godsend compared to the flight to China! We breeze through customs, hop on the express train from the airport and in 1.5 hours we get to our stop, Shibuya, which couldn’t be more convenient as it also had an entrance to our hotel right there connected to the station. Quadruple win! So far this trip couldn’t have worked out any better if I planned it. We get checked in and even though we had a minor communication error on my booking the staff was extremely accommodating and we got to our room. Right as we were considering laying down and crashing at 7pm my friend, Karen, gives us a ring and proposes dinner. A little backstory, Karen is a friend I met back in 2007 when I went to Thailand. I vowed to come visit and we’ve kept in touch ever since. Anyway, being two people who have never turned down a meal we said yes and rallied our second wind. It was a good thing we did as Karen took us to an izakaya and we ate and drank for hours. Our meal consisted of a variety of things but most unexpectedly was the dried sting ray (Ill add the pic later) which was a little salty but not bad. The chicken on a stick, shrimp wraps, salad, dumplings, and cold beer were just what we needed. A perfect start to our trip. We went back to our hotel, crashed and tried to gather ourselves for the next day, although nothing we could have done would have prepared us! LE and I woke up around 8 well rested and ready for the day, so we thought! After a few Internet searches for directions and such we headed to the included breakfast in the hotel restaurant and we immediately realized we were up for a challenge. We got seated and weren’t sure what to do so we just sat there confused and watched a Japanese mom and her daughter to fill their plates. Breakfast was a mix of traditional Japanese and American fare, quite good. After, we went up to the room to grab our things and headed out for the day, at least that was the plan. I ended having to return to the room three times for things we had forgotten. That should have been the first sign the day was going to be out of balance. We thought heading to one of the nearby parks which houses one of the more famous temples would be a quick and easy start. Well, after the 2+ mile walk to the park in 90+ degrees we realized things in Tokyo are much farther than we think. We still made it to the park and walked in looking for the temple which should have been right in the middle according to the map. What we didn’t know was the park was split into two and they did not connect. We figured this out the hard way. In between the 2 entrances there was a lady cooking some sort of wok noodles on a street cart that looked and smelled amazing. We thought we’d run into the temple park and then check out the noodle pusher. The park was impressive, probably more then the shrine, and we worked up an appetite for some street noodles. Then we had the realization that we still didn’t have any money. We had a credit card but the odds of a 60yr old street noodle lady taking Visa were slim so we walked across to the nearby shopping district in search of an AtM. A search that in most countries would take no time but in Japan not so much. We walked inside malls, stores, and even banks but no ATM would accept non-japanese cards! Racist atms! We eventually learned that only Citibank ATMs work for us. No sweat, we’ll hop on a random wifi and look for the closet One. Wrong again! Tokyo being one of the most technologically advanced cities in one of the largest consumer electronic producing countries in the world, doesn’t have free wifi anywhere! There are hotspots but they are run by the telecoms and only for subscribers. Not helpful. So now we’ve been walking around for hours in the Cosplay district and gave up on the noodle lady because we couldn’t find an atm or wifi. Fantastic! We debated going to McDonalds, we were that hungry! We held off though and decided to hop on a train and go to another district because we’d surely be able to find an ATM and wifi there. Well we had to use the CC to get our tickets so we waited in line for the ticket office and got to the counter only to realize the computer wouldn’t read my card. Awesome! Luckily my ATM card worked and we were on our way from Harajuku to Ebisu, home of the “beer museum.” Perfect, a beer would be just what we needed after walking in this hot and humid day. The beer museum turned out to be a huge building with a small room of old bottles and a fancy tasting bar……that didn’t accept any cards! So here we are sitting on the side walk bench with no cash, hungry, without wifi and no idea what to do. We tried to make the best of it by going to the Nature Institute which houses a jungle in the middle of Tokyo. At least that was the plan. It looked so much closer on the map, we walked which seemed like forever to the Megero district where another cluelessly lost American tried to ask us directions. Ha! We walked with them for a while to try and meet up with their Japanese friend who we hoped would help us find an AtM. As we were wandering around looking for his friend we finally found the nature institute that to no ones surprise was closed long before we would have ever found it. At the hotel, Karen had called and asked us to dinner. Which, after a quick change we happily accepted. She met us in our hotel and could obviously see the dejection on our faces and asked “do you guys like meat?” We assumed that was a rhetorical question as I have meat running through my veins. She took us to a Yakiniki, a Korean style restaurant with a grill in your table and ice cold beer and on our way she showed us an ATM that worked! Total redemption! A perfect way to rally from the long day and fight back to Tokyo 1 Roberts 1! Every morning Mon-Fri, I take my dogs on a 2.5 – 3 miles hike / walk / jog (depending on how im feeling) at a trail nearby. The routine never changes both Jaxson and Sasha know when its the weekday (when they get their park trip) and when its a weekend (when we normally don’t go) and I assume it has something to do with LE getting up before me or not. When I do get up after her, they immediately get excited. They bounce around and whine for 10-15 minutes while I enjoy my hot tea and oatmeal and when I’m done the run for the garage door and out into the jeep as soon as it opens. We get to the park and Sasha runs off to sniff around on her own and Jaxson jumps out and waits for me to throw the frisbee all the way down the field. By the time we get to the end of the field and the trail beginning Jax heads for the creek to get a drink and in the summer cool off. The very first time he went in there he dropped his frisbee in the water and lost it, but ever since then he’s never lost another. He still goes into the creek and you’d think by now he’d learn to leave the frisbee outside of the creek but nope he’s adapted in a different way, he’s learned to find his frisbee underwater. Every time we walk he does this. I finally got it on tape b/c its too good not to share.